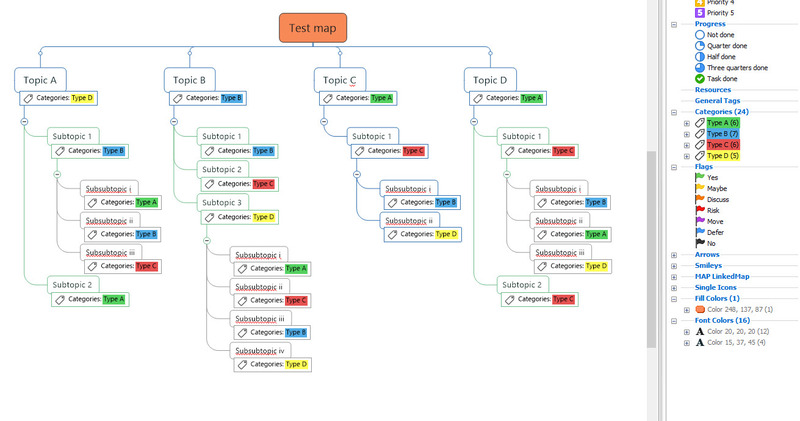 Colouring topics based on tags or icons is an effective way to visually categorise them in a complex mind map. 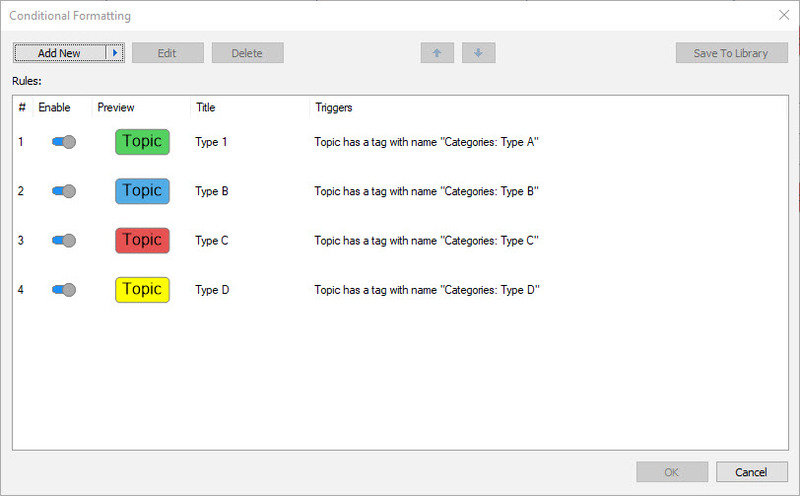 However, while the ability to colour text tags has been added to MindManager, the program still does not provide direct automatic fill colouring of topics based on their tag or icon. Some time ago I described a method for colouring topics based on their category by using Outlook as an intermediary. This was part of a process for integrating MindManager topics and Outlook tasks and applying a common colour-based category system between the two programs. This method still works but the conditional formatting feature introduced in MindManager 2018 has now provided an easier and more direct way to colour topics based on icons and tags without involving Outlook. Even if you still want to maintain Outlook synchronisation, conditional formatting allows you to maintain topic colours independently in the two programs. You can continue to match Outlook’s category colours in MindManager, but you can also access a much wider palette than Outlook’s limited range. Isn’t this approach overkill, given that you can add colours to text tags? Perhaps the best advantage is the ability to reduce visual clutter in a map by hiding the icons and tags themselves, while making it easy to recognise a topic’s category based on its colour. Create the range of text tags. 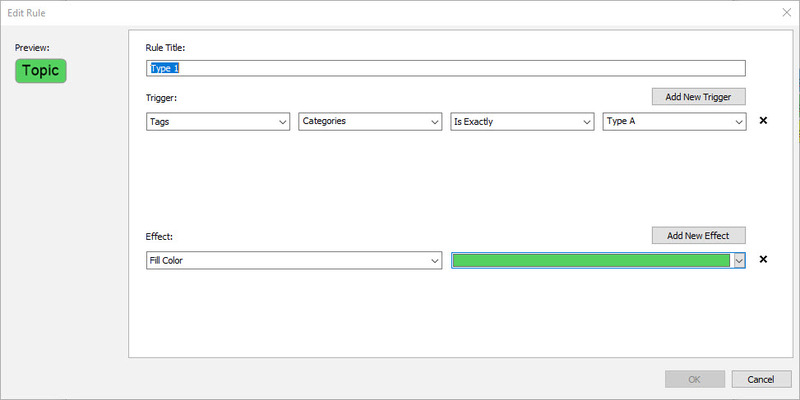 You can use the General Tags group or create a new tag group; if you want to sync topics with Outlook Tasks and maintain the same categories you will need to create a new group specifically named “Categories” and make the tags in this group mutually exclusive. As you create the tags, assign a unique colour to each of them. If you are using custom colours, record their attributes. Apply the tags as required to topics in the map. Click on Conditional Formatting in Dashboards on the Advanced tab on the ribbon. Add a new rule and when the dialogue box appears give it an appropriate name. Select Tags under Trigger in this dialogue box and then the name of the tag group. Select “Is Exactly” from the selection option dropdown list and click on the first tag on the list. Under Effect choose “Fill Color” and then select a colour matching the one you used. Then click OK.
Repeat these steps to rules with matching colours for each text tag in the group. As each rule is added the tagged topics should change colour. If you are synchronising with Outlook you can now send topics there as tasks. Even if you apply a different category colour on the Outlook side to these tasks, the colour you have chosen in MindManager should override it in the map. To hide the tags themselves go to the View tab and select Show/Hide under detail. When the dialogue box appears untick the entry for Tags on the list. All tags should disappear from the map but will still be active. If you wish to tag additional topics, select the relevant ones then click on the relevant tag in the Map Index. The selected topics should change colour to match the tag in the index and the count in the Map Index will be adjusted, even though the tags themselves won’t appear. You can use the same approach to colour topics based on all available icons, including priority icons. Obviously, topic colours can be used to reflect only one set of tags or icons, but you can apply other topic attributes such as line colour, bold and italic text based on other tag or icon sets.